What’s it like to be third in line for a Bassmaster Classic seat, knowing only two seats are available? Ask Chip Harrison, Randall Tharp or Clark Reehm. Each holds that so-close, yet-so-far-away third-angler position in their respective 2010 Bassmaster Open divisions, each of which awards Classic tickets to the top two points earners. Harrison from Bremen, Ind., is the third angler in the Northern division. Tharp from Gardendale, Ala., is the Southern’s No. 3. Reehm, a Bassmaster Elite Series pro who recently changed his address to Lufkin, Texas (see below), ranks third in the points standings in the Central Open. Each Open division has one more tournament through which pros can earn points toward entry in the 2011 Bassmaster Classic, Feb. 18-20 on the Louisiana Delta out of New Orleans. “The Classic is my No. 1 priority,” said Harrison, a full-time pro gunning for his first Classic entry. He’s qualified for four national championships in other major circuits, and just this season got back into Bassmaster competitions. “When the Northern Opens came out with their schedule this year, and they had one on Champlain and one on the Detroit River, which are two of my favorite bodies of water, I couldn’t pass it up. 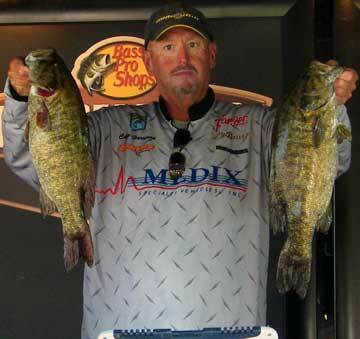 I thought it would be a good chance to try to qualify for the Bassmaster Classic,” he said. Harrison sits one point away from his goal: He has 511 Northern Open points to Wisconsin angler Travis Manson’s 512 points. Much tougher for Harrison would be to topple leader Ryan Said of Wixom, Mich. With 585 points, Said has a significant head start going into the division’s final event, Sept. 16-18 on the Chesapeake Bay out of Cecil County, Md. 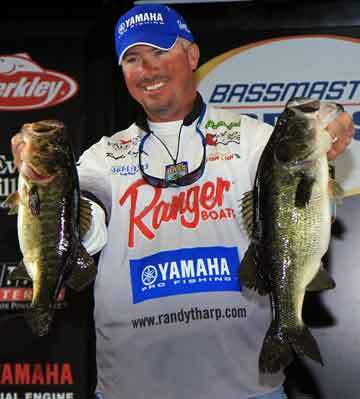 In the Southern Open, third-man Tharp has 538 points to the 546 points of Bassmaster Elite Series pro Bobby Lane of Florida. Points leader Andy Montgomery of South Carolina has 550. The Southern Open finale will be Oct. 7-9 on Lake Seminole out of Bainbridge, Ga.